For those of you who have been tapping away at Curiosity, Peter Molyneux's mobile-based social experiment (a few of us certainly have), it's finally come to an end. 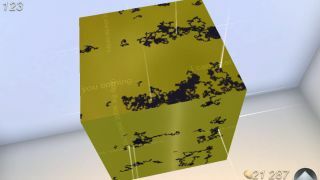 After 150 days of players breaking away the layers of 22Cans's virtual cube, a winner made it to the centre, receiving a video directly from Molyneux himself explaining the big "life changing" prize that had been promised. The winner had the option to keep their prize a secret but Bryan Henderson from Edinburgh was happy to reveal himself as the successful cube cracker. His reward? To play the role of god in Godus, the next game from 22Cans, from which Henderson will also take a revenue cut. So there you go. God really does exist - and he's a Scot.